In this campaign documentary, would be candidate Jia Zhitan will serve as his own Charles Drew. Unfortunately, instead of documenting the start of his political career, he winds up exposing the undemocratic nature of the Chinese Communist Party’s sham democracy. While Jia will not fulfill his ambitions, at least he will put a lot of bureaucrats on the spot in I Want to Be a People’s Representative, which screens as part of Cinema on the Edge, the retrospective tribute to the Beijing Independent Film Festival. Jia is not just a farmer. 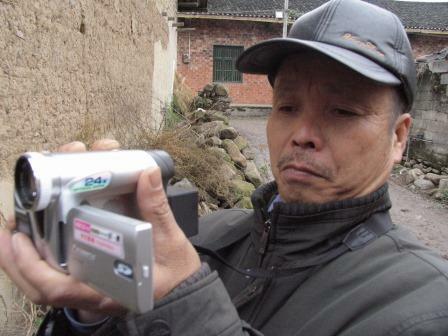 He is also a member of the grassroots Villagers Documentary Project, with real nonfiction filmmaking credits to his name. That might sound impressive, but it means he already has two strikes going against him with the powers-that-be. Nonetheless, many former officials are happy to write glowing endorsements of his candidacy. He thinks he is well on his way after advancing to the run-off, only to be disqualified for reasons nobody will explain. Of course, it is not for a lack of asking on his part. Frankly, probably only Jia is surprised by this turn of events. After all, he was openly building a case against the local factory that had turned the nearby river into green viscous goo. Jia Zhitan is the sort of troublemaker who will always get knocked off ballots, but none of the officials he confronts can muster any justification whatsoever. What is most striking about IWTBAPR is Jia’s idealism. Intellectually, he has to recognize the likelihood of this kind of ham-fisted response, yet he is still surprised when it happens. The leathery farmer is no Jack Kennedy, that’s for sure, but he is much more of a man of the people. In a way, his guilelessness also gives a fearlessness that lets him ask his ambushed interview subjects just what the heck is their problem, anyway? Although it is only seventy-eight minutes, there is still a bit of slack in Jia’s doc, here and there. Nonetheless, he gives viewers a good sense of his community and its various power players, with whom he has such ambiguous relationships. It also demonstrates how empowering the Villagers Documentary Project has been. 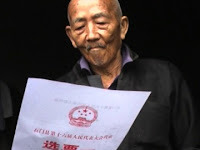 Surely, Jia Zhitan was not the first candidate with broad popular support to be thrown off a local ballot, but few ever caused so many headaches. Recommended for those who want to see a little bit of speaking truth to power (at its pettiest), I Want to be a People’s Representative screens this Sunday (9/13) at UnionDocs, as part of Cinema on the Edge.